Nassim Nicholas Taleb’s new book is out, which made me think about his previous work, Antifragile (which I enjoyed greatly). Some things benefit from shocks; they thrive and grow when exposed to volatility, randomness, disorder, and stressors and love adventure, risk, and uncertainty. Yet, in spite of the ubiquity of the phenomenon, there is no word for the exact opposite of fragile. Let us call it antifragile. 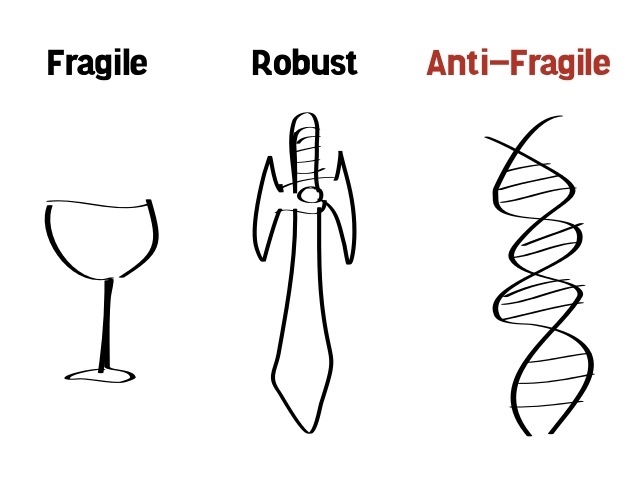 Antifragility is beyond resilience or robustness. The resilient resists shocks and stays the same; the antifragile gets better. This property is behind everything that has changed with time: evolution, culture, ideas, revolutions, political systems, technological innovation, cultural and economic success, corporate survival, good recipes (say, chicken soup or steak tartare with a drop of cognac), the rise of cities, cultures, legal systems, equatorial forests, bacterial resistance … even our own existence as a species on this planet. This definition, and the examples Taleb pointed to in his book helped me understand the world a bit better. It’s easy to point to entitled people and see how they manage to get richer no matter what happens. But I think we all know people (and in fact companies, organisations, and communities) that are just set up for success. The notion of them being ‘antifragile’ helps describe that. Play the long game, keep your options open and avoid total failure while trying lots of different things and maintaining an open mind. Some great suggestions here, and I’m very much looking forward to reading Taleb’s new book. As a bonus, in putting together this post I discovered that, after jobs at Twitter, Slack, and Amazon, Buster Benson is writing a book. He’s looking for 100 supporters at $1 a month so I didn’t even think twice and pledged!